Posted 06:05 by Rich Davies & filed under Homebug How-Tos. Lots of people buy energy monitors so they can see how much power they are using. Here, we show you how you can monitor your power yourself for free! The first thing is getting to know your meter. You probably already know that the screen shows you how many credits you’ve got left and maybe even that the flashing light blinks 1000 times for every one of those credits that you use up (it depends on your meter, but if your says 1000 imps/kwh – that is what it means, 1000 flashes for every kilo-watt-hour, otherwise known as a unit of credit). To get access to the inner secrets of your meter, you’ll need to type some things into your keypad. This is the same keypad you type your prepaid token into — but rather than a very long number, you’ll just type a short code. The most useful secret function is the ‘current power’ function. On most meters you get this by pressing #1# on the key-pad. The display will change to show you how much power you’re using RIGHT now –> don’t worry your credits haven’t gone anywhere, they’ll appear back on your screen after a little wait. On some meters you can press the backspace key [<-] to get the credits-left screen back quicker. Using this function we can ‘check’ how much each device in our home uses. As you can see in the picture on the right, with just a few lights and a TV on in my home, I use 0.48kW. This means that over ONE-HOUR I use 0.48 kilo-watt-hours. Make sense? If I used this much power for a full day (i.e. for 24 hours) I’d use 11.52 credits — 0.48kW x 24 hours = 11.52 kWh. Switching everything off I can get this pretty close to zero, in fact the lowest number I could get without going crazy was 0.12kW. So now for the useful bit! Using this new found energy-monitor to measure how much things in my house use. When I turn on my geyser I can see two things change. Firstly the light on the front of the meter starts blinking quite quickly. Also the bars on the front of the meter start to step up. Now when I press #1#, the reading says 3.96kW. Next I switched off my geyser and turned on the kettle. Waiting a little for the readings to update (you should wait around 15 seconds between each reading, the experts say! 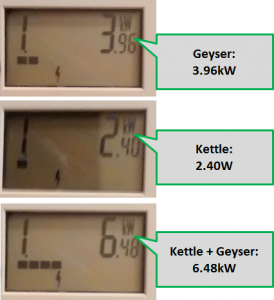 ), I found that my kettle uses 2.4kW right after it is switched on. Finally, as a check. I turned on the geyser and the kettle at the same time – which gave me a reading of 6.48kW. 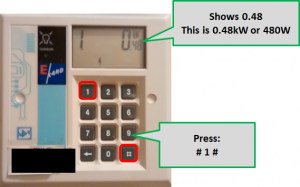 So, no need for expensive energy monitors, we can do our own checking for free using our meter. I’ve only got one electricity meter so I apologise if the examples below don’t work for you or if your electricity meter doesn’t do the things that mine does. Please leave a comment if it works on your meter! The next post will be about how we convert these numbers into Rands and Cents! What does it mean if one loads electricity into a prepaid meter and the screen fills with EEEEEEE’s and doesn’t accept the voucher number ? my cash power has a cod, thus i need reset code for my cash power. This cash power meter is LANDIS no:07100262885. The code block electricty to be used. Hey there. I’ve had a look around – and sorry Randy, but I can’t find a way to stop it beeping — other than keeping it topped-up of course! Sorry for the delay in replying! – took me a while to find but I got it. In fact it seems the L+G meter’s have LOADS of extra functions I didn’t even realise they had. Send us a picture / model number and we’ll see if we can find the equivalent! I’ll have a look and see what I can find! 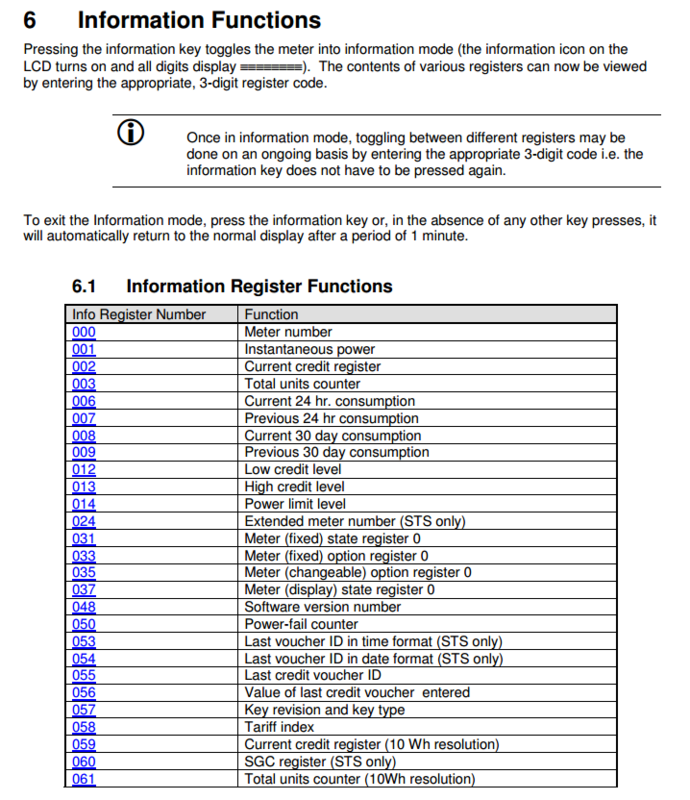 I have a TaleXus Actaris – Taurus meter which doesn’t respond to the commands. Do you know if the commands are available on my meter?